A long time ago in one Urals village there lived a famous stone-craftsman named Prokopyich, who had a talented young apprentice, an orphan named Danila. Danila had been something of a daydreamer who found it hard to fit in, until he came to work for Prokopych. Under the craftsman�s guidance, he developed into a very skilled artisan, who had an unusual appreciation for natural beauty. Once, Danila heard the story of the Stone Flower, which was in the realm of the Mistress of Copper Mountain. Ordinary craftsmen could not create works that compared with the craftsmen of Copper Mountain, since they had seen the Stone Flower, and could understand the true beauty of stone. This story made a deep impression on Danila. Prokopych grew worried that Danila�s fascination with the Stone Flower would prevent him from being happy. He urged him to marry a nice girl named Katya, who liked Danila a lot. Eventually, Danila and Katya got engaged. The young man was still frustrated by his failure to create truly beautiful stonework, but as his wedding approached he thought, �Maybe I am just not able to understand the power and beauty of the stone," and thought about the marriage instead. But on the day before the wedding, he couldn�t help it � he had to visit Serpent Hill, where he had once thought he heard a woman tell him to look for stone. He sat down to think about the Stone Flower. "How I desire to see that flower!" he mused. All a sudden the Mistress of Copper Mountain appeared before him. Danila begged her for a glimpse of the Stone Flower. She calmly replied that she could show him the flower, but he would regret it as he would leave behind his loved ones to live in her mountain. She reminded him of Prokopych and Katya, but Danila was firm. He had to see the flower! "There is no life for me without it!" he cried. So she took him and showed him the wonderful Stone Flower. In the evening Danila came home for the last time. He was in a strange mood, and avoided Katya�s questions. Later that night, he ran away and vanished without a trace. Three years passed, and all this while, Katya never forgot about Danila. After her parents and then Prokopych died, she made a living for herself, creating brooches from stone. She went to Serpent Hill looking for some good pieces of stone, and sadly thought of Danila. Suddenly she saw a beautiful piece of malachite. She wondered if it could be a sign from Danila. She went home and fashioned the stone into the most beautiful brooch she had ever made, and sold it for a fine price. As soon as she could, she returned to Serpent Hill, and there she saw a vision of Danila. She went back to the village to tell the people what she had seen, but no one believed her. The next day, she went back to the same place and suddenly the Mistress of Copper Mountain appeared and demanded why she had come into her garden. Katya bravely replied that she wanted her beloved Danila back. The Mistress of Copper Mountain said that Danila would have to choose between his craft and Katya. She summoned Danila and warned him that he would forget everything he learned in the mountain if he went with Katya. If he stayed in the mountain, he would have to forget the rest of the world. Danila sighed, "I am sorry. I can't forget the people I love. I think about Katya every minute of my life." The Mistress smiled and sent them back, with a rare gift: Danila could keep his knowledge of stonecrafting. All she asked was that they would not tell people about the mountain. Katya and Danila returned home, filled with joy, and they lived happily together for many years. 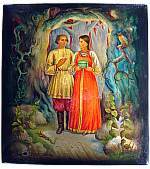 Danila became known far and wide as the greatest stone carver in the Ural Mountains. Narrative and translation: Copyright 2003. Donna Richardson and Tatyana Stonebarger. Introduction by Donna Richardson. Edited by E. McA. Stewart. Search results:Page 1 of 2 total pages with 11 results.